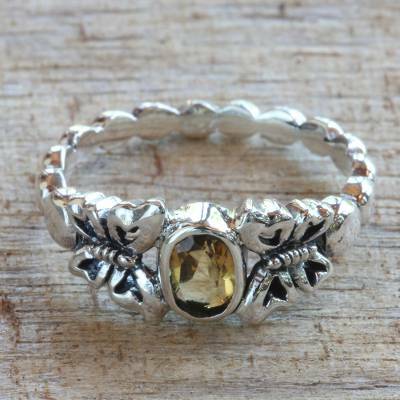 Hand Crafted Citrine Sterling Silver Butterfly Cocktail Ring, "Honey and Butterflies"
As if sipping sweet nectar from a blossom, two butterflies perch next to a 1-carat golden citrine, the November birthstone, in this ring from Bali's Komang Wijayana. He crafts the ring from sterling silver, carefully detailing the bodies and wings of the butterflies and the slender sculpted band. You can find citrine cocktail ring 'Honey and Butterflies' by Komang Wijayana in jewelry categories such as Animal Themed Rings, Birthstone Rings, Citrine Rings, Silver Rings, Sterling Silver Rings, Single Stone Rings and Cocktail Rings. Enjoy exploring these sections for other Novica treasures. "definitely one of the finest rings i own"
the craftsmanship is excellent/and the sliver and gold so beautiful /since my cancer has caused to me to lose weight I had to give to a friend(she had always admired it's loveliness). Now I want to get a 7 1/2 but I do not see 1/2 sizes listed.. Saddens me as being in Hospice I could not leave to take to a jewelry store to be made smaller. anyway it even more beautiful than the picture! and butterflies and citrine are both used in healing! I love this ring. The honey colored stone is very pretty! I received my new ring today. Good workmanship pretty detail and fits well. Thank-you to the artisan for making my ring.,I received my ring today. Good workmanship, pretty detail and fits well. Thank-you to the artisan for making my ring.